Sofas, chairs, ottomans, poufs, floor pillows, benches and everything related are all different forms of seating, each with its own set of special characteristics. It doesn’t matter which one you prefer as long as you find the design that makes you happy. We’re already looked at a bunch of cool chairs with awesome designs as well as at some exquisite sofas and even a few contemporary benches worth mentioning. Now we have a few more seating options that we’d like to share with you. They range from comfy chairs to sculptural benches and themed sofas. The stylish design of the Acapulco Chair is of mayan inspiration, created using traditional weaving techniques. Each chair is handcrafted by artisans from El Salvador and the current look is modernized version of the original design from the 1950s. This is the Jacques Guillon Cord Chair. It was designed in 1953 but it looks in tone with all the contemporary creations we’ve seen in the field. The chair is minimalist and its design is a bit contradictory. On one hand, the wooden frame is solid and strong but, on the other hand, the seat and backrest are very light and minimalist, being made of tightly woven straps that run through the frame. A chair shaped like a giant hand is pretty unusual and not something anyone would bring into the living or dining room. In this sense, the Golden Hand Chair is exactly the type of eye-catching statement piece you need if you’re going for a stand-out, unconventional decor with striking furnishings and ornaments. It’s not exactly a bench but it’s not a simple chair either. This hybrid is special both in design and material. The seat is a long slice of wood which shows all the unique features of the tree trunk it came from. The seat is longer than the backrest and that’s a bit confusing. This doesn’t look like a regular folding chair and that’s only natural since it isn’t just any mainstream chair. Its design is quite unusual, featuring an intriguing folding mechanism which allows the chair to be packed for easy storage and transport. Nido is another unusual chair but its design is different in a different way. The seat is this curved shell, like the inside of a hat. The legs that support it are thin and almost noticeable. The focus is on the delicate and really cozy-looking seat which folds over the frame seamlessly. This would make a pretty cool accent chair. 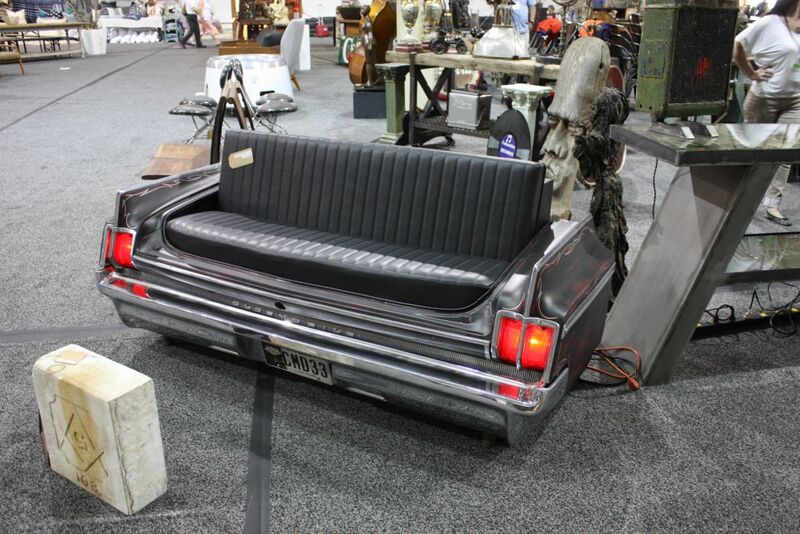 For car enthusiasts, a themed seating module like this one would be a cool acquisition. There are several designs and products to choose from in this category and this is merely one of the examples. It’s something you could put in a man cave, a basement or a game room. With a design like this you kind of expect the name of this armchair to be Bubble. That’s actually the name of a series which also includes a comfy three-seat sofa, a two-seat sofa and two ottoman models. They’re all bubbly in form and they come in all sorts of vibrant and quirky colors and color combinations. They maintain their shape really well and they’re very soft and cozy. The Sesann series is cozy and comfortable too. The sofas and armchairs is this collection have these bulky and rounded shapes given by the soft and comfy cushions that make them most of their structure. They metal frame which holds them has this continuous structure which basically shapes the cushions into furniture. You can find these pieces with both leather and fabric upholstery. This is Wallace, a stylish and sculptural seating module designed by Jean-Marie Massaud in 2010. It’s meant to serve as an armchair, featuring a base made of painted metal and a structure made of moulded polyurethane. The leather cover gives it a refined and elegant look, highlighting the armchair’s sculptural forms and curves. The Grid armchair is the type that would fit beautifully in a variety of modern-industrial decors. It’s a digitally-designed chair with a fluid geometric form. It’s lightweight and graphical and it’s made of polyester powder-coated stainless steel wire overlaid in a distinctive pattern similar to weaving. Meet Aria, a chair that looks like a modern sculpture. It’s a very stylish piece of furniture with a distinctive form and a lightweight and breezy appearance. Put it in the living room by the sofa, in front of the fireplace or take it outside on the patio or in the garden. Speaking of graphical designs, check out the Sign Filo chair and its refined structure and sleek silhouette. Each chair is made of 45 meters of steel wire in four different diameters. They’re assembled by hand and have over 226 sealing points. You can find it in several colors including black chrome, gold and pink gold.